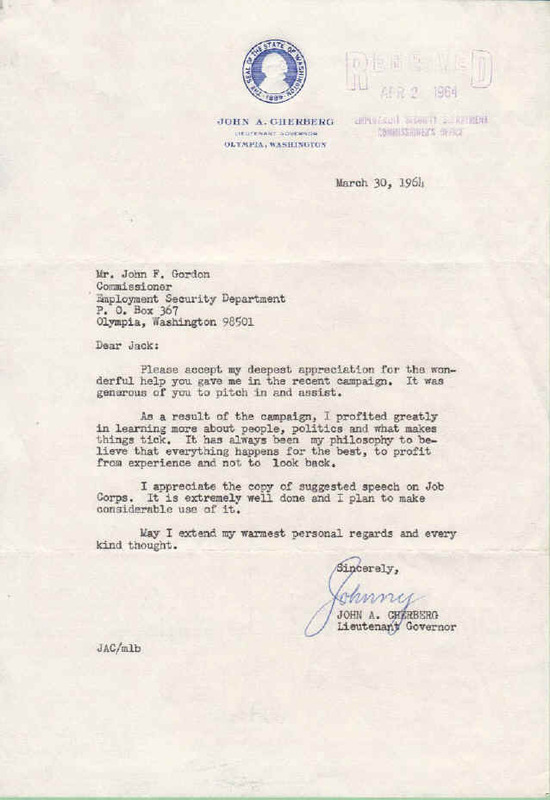 While Jack was still Commissioner of Washington State's Employment Security Department, he helped John "Johnny" Cherberg, the Lieutenant Governor, in an election. Cherberg wrote Jack a gracious thank you note. Because he served as Lt. Governor during the terms of 5 (count 'em, five!) governors (Al Rosellini, Dan Evans, Dixy Lee Ray, John Spellman, and Booth Gardner) over a period of 32 years, Cherberg was affectionately known as "Governor." 20 Years after he wrote this letter, he was, of course, still friends with Jack, as this picture shows.